Rose Marie Segale was born on January 23, 1850 in the small village of Cicagna in Italy. When she was four she and her family moved to Cincinnati, Ohio, part of the initial wave of immigration from Italy to America. From her earliest childhood she was determined to be a sister and frequently told her father that she wanted to join the Sisters of Charity as soon as she was old enough. She began her novitiate at the age of 16. When she professed her vows she took the name of Blandina Segale. 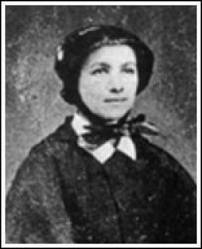 She taught at Steubenville and Dayton, and in 1872 she was ordered to Trinidad for missionary work. Initially she thought that she was being sent to the island and was thrilled. Instead, she was sent to Trinidad, Colorado in the western part of that state. What she found when she got there, was a town that was frequently visited by outlaws and where lynchings were common. A fairly rugged environment for a 22-year-old sister! Nothing daunted, she began to teach. Soon after she got there she stopped a lynching by convincing a dying man to forgive his assailant, the father of one of her pupils. Sister Blandina and the sheriff brought the accused killer from the jail where he was being held to the bed of the dying man, through the midst of an angry lynch mob. The dying man, very generously I think, forgave the man, the lynch mob dispersed, and the man’s fate was determined by the court and not the mob.